Is this a trustworthy platform that can help you look for legitimate jobs while you stay at home to look after your family? 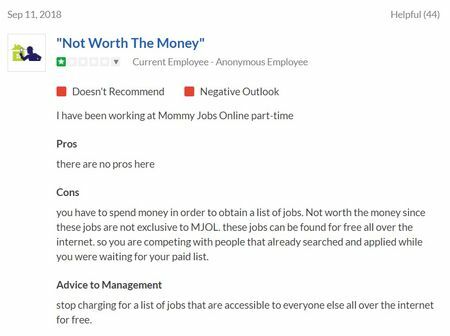 Or is Mommy Jobs Online a scam? Many websites and work at home job platforms are out to prey on vulnerable people who are just trying to earn some honest extra income while being there for their kids or caring for some sick and aged family members. 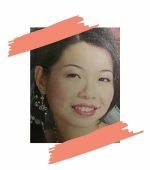 I am a mom to 4 young kids myself (you can read my story here), so I totally understand the struggles between not wanting to miss their growing up years, and the need to contribute financially to the family. It would be a dream come true, to be able to make an online income from home, while fulfilling our mommy’s duties to the kids, of cooking, washing up, changing nappies, and finally being able to smile while they nap (wink wink). So will Mommy Jobs Online give you a helping hand in this direction, or is that hand just trying to sneak into your handbag for that purse? We will answer this question and more, in this honest, unbiased and in-depth Mommy Jobs Online review. 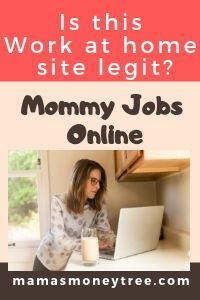 Mommy Jobs Online is simply a database of work from home jobs, which you can actually find for free on other platforms and forums. Because you are required to pay an upfront fee to access their database, the onus is not on them to land you a good-paying and legitimate job, since they would have already pocketed the fee, you are pretty much left on your own. This is not a worthwhile website to put your money in. Read on for the detailed review of Mommy Jobs Online, and why I do not recommend it. On the surface, it does look professional and legitimate, though other parts of the homepage not captured within this screenshot add lots of clutter that I do not like. It’s like they are trying to provide too much information, trying to sell to you that they have lots of things going on, lots of opportunities to explore. It didn’t take long for me to realise this is a platform where you have to pay an upfront fee, to join them as a member, before you can start using it to look for work from home jobs. 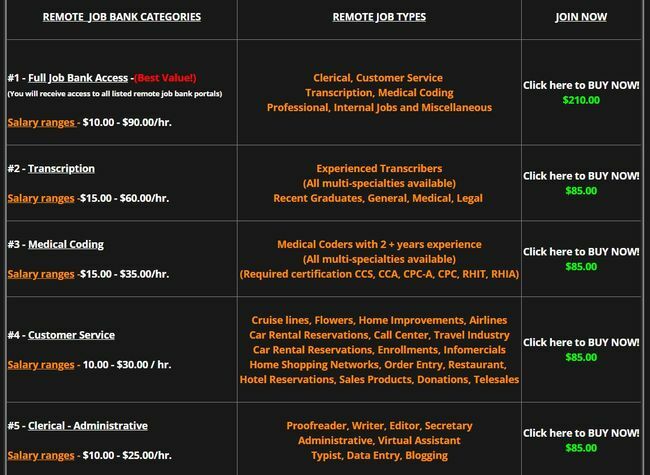 There are different categories of jobs database that you can choose to access, each one costing $85. Examples of categories include transcription, medical coding, customer service, clerical and administrative, and so on. For $210 one time payment, you get full access to all categories inside their job bank. I do not like how this platform works. By paying a one time fee to join as their member to access their job bank, you are pretty much left on your own. There is no value for them to keep the jobs up to date, since they already pocket your money. We will never know how updated or legitimate those jobs on their database are. If they are not incentivised to land you a job, then the platform easily turns into a complacent one. Moreover, you can find many of those jobs listed in their database elsewhere on other platforms, for FREE. Many of those giant work from home platforms that I tried include websites like Freelancer, Guru, Upwork, ClearVoice, and so on. Those platforms are competitive, and are absolutely free to join, and put up your profile, portfolio, and so on. It’s a buzz of activities on there, you can see employers are actually engaging the service of the members inside those platforms. When employers decide to engage you, the platforms then take a commission off your pay. This is a fair and transparent system, since you are using their platforms to look for a job. So they deserve to be paid an agency fee when you do find a decent job that you decide to take up. In this way, anybody can join the platforms for free, as well as access their job listings. But those platforms earn only when they add real value to their members by staying up to date with new and current jobs, such that members can actually find jobs. To see if it withstands real users feedback on it, check out this that I found on glassdoor. Doesn’t look too good, does it? No doubt there are some positive reviews, but the negative ones outweigh them. I will just show you a couple of negative reviews here, and you will get a sensing of how effective this Mommy Jobs Online is, in landing people real jobs. I think these reviews can speak for themselves. Let’s move on to look at what is working great for me, shall we? Since staying at home for my kids, I have tried various means to earn an income from home, so that I can share the financial burden with my husband. I tried freelancing. I love to write, so I tried out some writing jobs. I have been blessed, and found an employer whom I am still happily writing for. Though it definitely offers time and space flexibility, I am still exchanging my time for money, just like any 9 to 5 job, except that I am able to work from home, or anywhere for that matter. I almost tried MLM (multilevel marketing), but I only put one foot in, opened my eyes big, took one look around, and quickly ran away. And aren’t I glad for that! You can see my views about some of the MLM companies I have reviewed, like Jeunesse, doTERRA, and Nu Skin, to name just a few. Then, I found something that changed my life and gave me a new outlook on the opportunities that abound on the internet. It is a lucrative income source, and it is called affiliate marketing. I simply leverage on the millions of existing products and services available in the market. I promote some of these products and services that I think will add value to people looking for answers in my chosen niche. When they make purchases through my affiliate links, I earn a commission from the retailers, for driving business to them. Among the many methods of making money online, I find this to be the best because it is neat and hassle free. I do not have to own or store any products, deal with any delivery, customer complaints or refunds, because the sales transactions take place between the customers and the retailers directly. Best of all, this is not a regular job where I exchange my time and writing service for money. I am building up my very own online business, an asset in the internet space. And through the way that I am able to get free traffic to my affiliate offers, I can even build this up into a passive income stream. That means my established business can be left to run on its own, and I will still be getting free traffic, and sales, on a daily basis. That’s the beauty of this business model, combined with the traffic method that I am using. It’s not a get rich quick scheme. Anything that claims to get you rich quick is in fact out to scam you. This requires time and hard work, but it will be worth it when you see it growing into a full-time income, and then a passive income, while you move on to build other income streams. You do get to access their database after paying the one time fee. But there is no way to know the quality of those jobs posted there, like how current and updated they are, until you try out the platform. Based on users’ feedback, I would advice against signing up as their member. This kind of payment structure where you are required to pay an upfront fee works best for the owners of the platform, as they make money for every single person that signs up. But it does not work for you, since it makes them complacent in keeping their platform competitive. Legitimate platforms that serve to genuinely help people land work from home jobs are completely free to join, so just go for those. 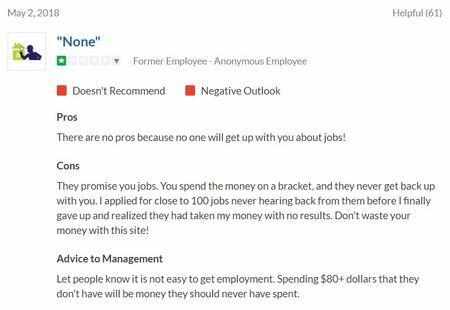 You have seen some samples of user reviews, and the overall review score on the Glassdoor review platform is very low, at 2.5 out of 5. 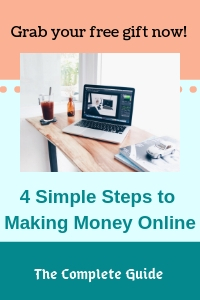 Even if you do land a job on Mommy Jobs Online, you are still trading your time for money, something that I wouldn’t really like to do, ever since I discovered how to build up my very own online business, and at the same time create a passive income stream that will sustain itself even as I leave it alone to work on other projects. My answer to: is Mommy Jobs Online a scam? Is NO, I wouldn’t go as far as calling it a scam, though it is something I would personally stay away from. Because I really do not need it to find a work from home job, when there are many much more transparent platforms out there. I do not recommend Mommy Jobs Online. I want to show you the business that I have built. It allows me to work from home full time, choosing my hours, and how many hours I want to work, since I am my own boss. So I put in all my effort when my kids are in school, and after they go to bed at night. I was searching for just some freelancing job that would make me some side income, but I now have much more than what I bargained for. If you have any concerns or questions regarding this Mommy Jobs Online review, do comment below, and we will start a conversation from there. 24/7 Wealth Club Review: SCAM? What is Commission Hero? Another SCAM?